Hi. To not interfere anymore with the related topic from Rachel and Sandy, I'll put my question on a separate topic. So the previous reply from Juerg was interesting, but I'm not sure it altogether explained how to note the differences between a decreased O2 supply OVER an increased utilization of O2 ? Here's a quick experiment yesterday that was conducted with client who has a known supply (respiratory) restraint. I kept the protocol same for the first 4 loads and permitted an extended reload before the fifth. The fifth effort had same load as previous, but I changed the pattern to reduce muscle compression. So the phenomena that I am now more focused on is that seem with the chart above, is it loading / supply changes more so than an O2 consumption by the measured muscle ? Perhaps someone has some charts / images showing different (flat, increasing) tHb trend that shows a decreasing %SmO2 ? Fred, as i am sure you have picked up I am new to the interpretations so in my effort to learn (rather than trying to answer your question) can you explain why would the following not be the correct rationale? - if a load commences and Sm02 drops steeply, this would more likely be due to increased utilization than it would reduced supply. - Where a load ends and Sm02 rises more slowly (or even falls) then a reduced supply type of argument may be a possibility. - After loads, the levels to which Sm02 recovers provides some indications - e.g. if it is a delivery issue then Sm02 peaks after recovery should be lower and lower as supply reduces? I realise that there could also be some exceptions to the logic above, e.g. muscles not relaxing completely after load etc - could cause a slower Sm02 recovery after load due to utilization rather than due to reduced delivery. And an additional remark wrt loads 2/3/4. Guys we are looking at 1%-2% differences. IMHO we are looking at some random error. Just a small extra strain or movement left to right or a breath extra or less (I am exagerating a bit I know), some other minor thing may cause such very very small shifts (or random error). In terms of trends we should look for bigger shifts really. Attached an example of an interval last week at constant power ouput 300 watt for 15 minutes. Rather flat thb but smo2 trending downward from say 35 to 25. See also the HR which is quite constant - just a tiny going down over the interval. Ryan, hi. Thanks for your reply. I'm sure the assumptions around the reactions measured throughout a 5:1:5 and other screening methods are on target. I do aim to practice them regularly in my gym. Rudd, hi. Thanks for sharing the images re: relatively stable tHb and steadily desaturating %O2, that gradual slope is is the type of image I was looking for. What do you think is the mechanism behind the desaturation, an increased delivery to cell and utilization OR a decreased supply ? I see heart rate is steady. Do you monitor your respiration rate or depth ? Or do you measure SpO2 during interval workouts ? Hi fred. When riding and saw this picture coming up I had also had some "doubts". But I noticed that along the interval my respiration got much slower (and same time not deeper), supported by the feeiling it got easier, which was however not expressed by very much declincing HR (that stayes quite stable or just a tiny tiny lower). I don't measure respiration but I did notice it. The 300w is below my (I know Juerg don't like the word) threshold and doing some 15 min at the beginning of a ride is not a hard effort. We used an HR monitor, a MOXY and a BioHarness for the live measures, and a finger tip spot checker for the immediate post-load % SpO2 (as an indicator of respiratory / VE performance). See top left text circled on image that Juerg shared a while back. If you are in hypercapnic situation, you have a right shift of the Dissociation Curve which means that hemoglobyn can easily releases O2 molecules to the muscle. PS for all the users of the forum: Shouldn't these kind of questions or specific cases go in the Questions or Case Studies rather than in the Public Webinars section? If so, the administrator should move them in the appropriate section. DanieleM, hi. Thanks for your reply. In future I'll be careful to post to more relevant category. 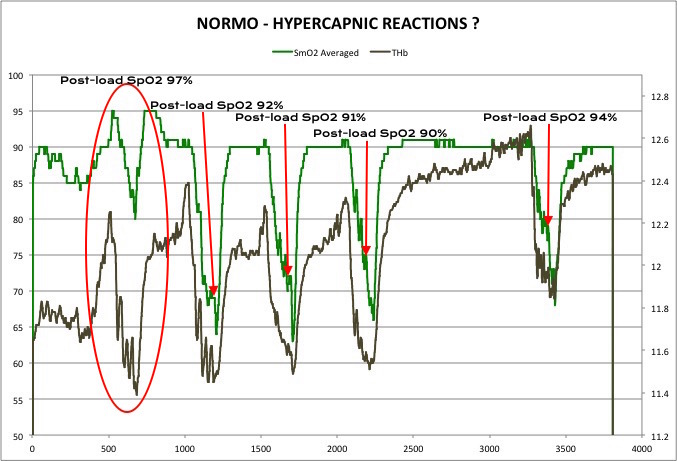 Regarding discussion of increased O2 utilization over a sharp decreasing supply, especially during possible hypercapnic periods, I'm still looking for some more ideas on this? We can see by the many many images posted throughout the forum that SmO2 will drop, but does the drop = increased utilization of O2. I wonder if any readers could share some NIRS charts/images of exercisers with limited muscular development -vs- exercisers with great muscular development, but both under hypercapnic strain? Increased O2 utilization over a sharp decrease of supply...Do you mean artificial occlusion by cuff? Or? I guess it could be a cuff-induced compression restriction, or any type of loading that sharply restricts a supply to measured muscle. Super great discussion and I love to follow this form the outside as this was a very hard and is a very hard topic. Here some ideas. Check it in a involved and non involved muscles at the same time. Than check it if you have the chance in a person, just after along injury or long inactivity of one leg or arm. Like THR or TKR after along waiting list. Than look at a person with a stroke. 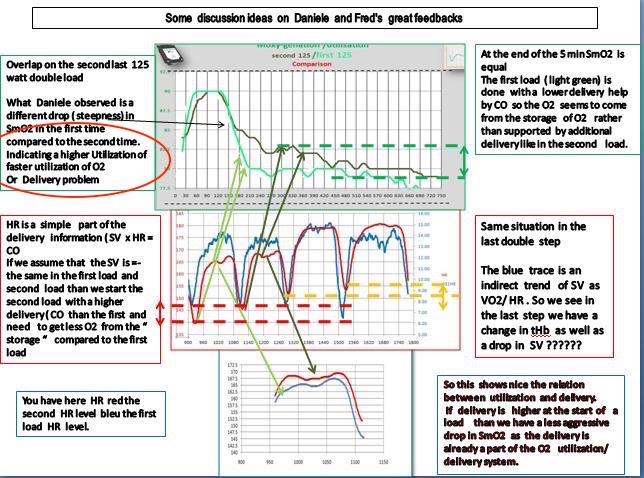 This is all nice to do as we know the limiter and therefor ca see, what actually happens. People with a lung resection after cancer. People with COPD and nearly on permanent O2 supply. Propel after hearty attacks or by pass surgery and or angioplasty. People after strokes and I had the "luck " to have a young girl fatter a stroke after a birth control pill with now complete recovery. People in altitude or eh opposite with enhanced O2 saturated air ( oxygenator) Fred points is a great one. He likes to know. Whether O2 us actually more use with or without hypercapnic or whether as I understand him right it is just used due to the shift in O2 disscurve. So basically if I work out and I use so much O2 anyway and now by the same speed I add hypercapnia to it, do I increase the use of O2 to the already O2 I use anyway. Fred is this your point. ? Juerg, hi. Yes, that's the idea. Under high compression work (tHb decrease) such as sled push/pull, squat, huge load on bike pedals, steep uphill run/bound, along with the addition of hypercapnia, does the quickly decreasing %O2 indicate an actual sped up ability for the cell to utilize ? Or is this more or less a situation of a quickly unloaded supply ? For most I think interpreting the MOXY is more or less an exercise in relationships and there seems to be 'cardinal' reactions associated with the many reactions. If this is the case, which sign or relationship would mark a truly increased utilization of O2 OVER a decreased supply ? Thanks for your thoughts to help me be able to identify this for myself going forward. Fred will be back with a very intriguing and head turning option to your question. It will go towards the ongoing fight between aerobic and anaerobic. Hint. O2 is used for the glycolytic reaction. If as some new research shows the CP.r is not that involved but O2 is very involved in ATP maintenance. than the question is what we do when we create this hard loads. Do we ask for a lot of O2 and how can the body cope with this demand the best. Is it a delivery limitation and is it a highly aerobic demand which is supported by a CO2 level to allow a better use of O2 form the storage area. ? Why does Gibala 's studies of 30 seconds all out show that great improvement of aerobic ability compared to the classical LSD? Juerg, thanks. I've been combing through the forum for some previously posted abstracts re: the milli sec uptake of O2. What was the end measure of Gibalis (spelling?) study that shows the greater improvements for 30s all-outs over LSD ?